This year in three boats we had six J14 boys: Joseph Barlow, Oliver Bulmer, Oliver Meredith, Adam Shelvey; and two of the Oratory J14s: Thor Butler and Aaron Petty. This very brief report includes mostly just the highlights of the voyage, which included 23 passages through locks. Introduction to the boats, and put all the parts together. Coxswain has cushions; scullers on hard wooden fixed benches padded with thick sheepskin squares, freshly laundered. A short training outing in the unloaded boats, learn the coxswain’s commands, especially for safety, e.g. “Stop! Hold her hard”! When steering a tight bend: “Hard on left!” (or right), “Lift!” means lift the handles to get the blades free to trail alongside the boat when heading for a narrow gap. Picnic lunch, load boats with the boxes and waterproof drybags, and away we go upstream to Kings Lock. Set camp on the wooded island between lock and weir. Explore the island: a few had a brief swim in the weir pool. Simple supper cooked in camp. 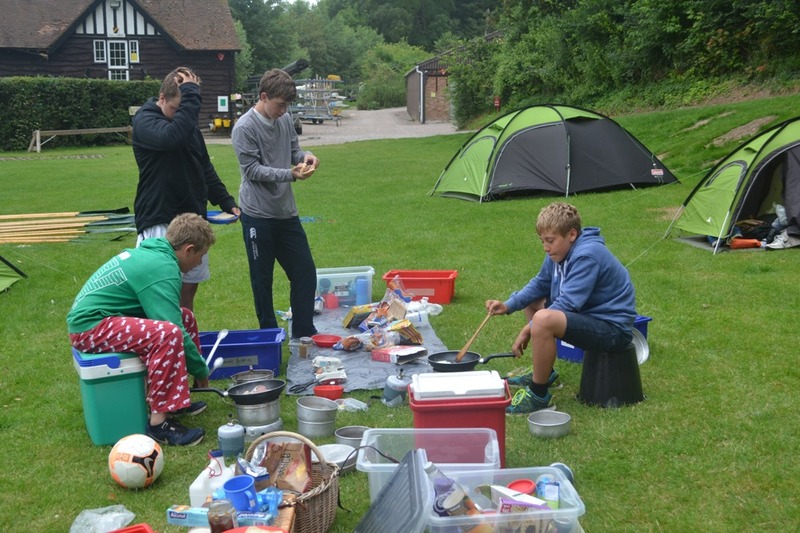 Boys cook breakfast on Trangia stoves. 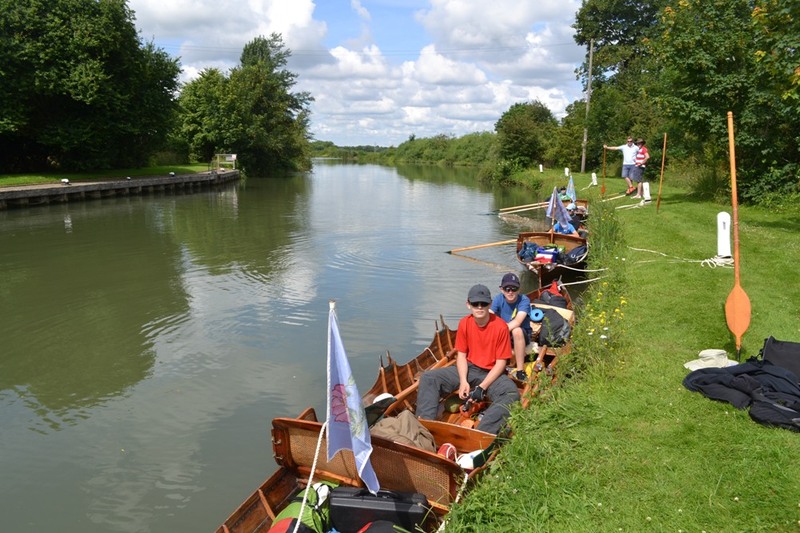 Strike camp and set off downstream, land at our Boat Club and have lunch at the Trout Inn nextdoor. Discuss plans for the trip. Then onwards to Oxford Sea Scouts base by Donnington Bridge. Set camp on big flat field: excellent for ball games. Walk to the Chester Arms for dinner. The inn is well known for excellent steaks. Strike camp. Onwards, brief stop at Radley College boathouse, to Abingdon. Into town to buy picnic lunch and provisions.Then past Abingdon School boathouse, where our J14s raced in octuple sculls in the Spring Term. Then to Clifton Hampden: very awkward moorings at the “wild end” of Bridge House Caravan Park. Facilities hardly changed in twenty years: 20p for a brief shower, 10p for hot tapwater. Past Wittenham Clumps to Shillingford: lunch at the Bridge Hotel. Wallingford, into town for shopping. Then a visit to Oxford University Boat Club with its high-tech flood protection system for the great number of eights and other boats. Finished day at Moulsford Preparatory School, setting camp on big field next to river. School cricket matches in progress, with travelling burger bar there which had lots to spare, so we didn’t have to do a camp meal. Lunch on terrace at Swan Diplomat Hotel, Streatley. Then past Pangbourne to Oratory School Boathouse. Boys encouraged to swim, but only Adam did. Mr Clapham prepared excellent BBQ in the roofed servery. He then celebrated success by joining in a fierce Nerf Howler battle with the lads. Through Reading; stop at the huge Tesco by the river, for picnic lunch and provisions. Then on to Shiplake College Boat House. Tents on the grass next to small boathouse. Went in unloaded boats to Wargrave, St George and Dragon Inn. A VERY long wait for the meal and we had to scull back to camp in the dark. Quite a daunting experience for those not used to it. In unloaded boats to Henley. Moored by River and Rowing Museum for a visit there. Lunch at Piazza café in the park. Then on foot with Mr Tom Burton to visit Leander Club. Return to Shiplake, where Mr Clapham prepared another delicious BBQ. Strike camp, paddle the empty boats to the small dock, ready for landing and loading them onto the trailers brought by Head Boatman Philip Colborne with Assistant Helen Popescu. After warmest thanks to Mr Tom Burton and his two scullers, return with boats to the Boat Club.